Ah, the joy of the shimmer and chime, quack and cluck, of Strat pickups. Then there’s the noise, but we learn to live with it in various ways, from cavity shielding to dummy coils to learning the right angle to stand with your guitar so the stage lighting doesn’t buzz through your amp quite so bad. Probably a good time, then, to confess that unfortunately, stack/noiseless pickups and actives are beyond my capabilities for now. But other than that, as with all my pickups, let your imagination run wild because I custom wind everything to customer specs. This means you’re not limited to the models listed below; consider them suggestions to jump-start your imagination. Feel free to mix and match specs and features. 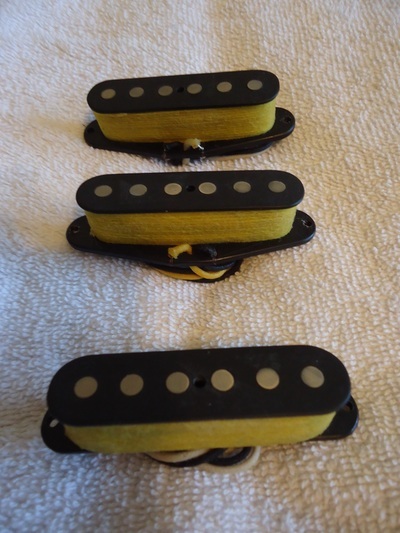 (Within reason, of course: Don’t ask for a 38.5k triple-coil bridge humbuckers with unobtainium magnets that sounds just like a vintage Strat neck when you switch to single coil mode.) Beyond that, the only limitation is I reserve the right to veto your idea if I don’t think it will work for the sound you want. Notes: You’ll notice that in all the sets listed below, the middle pickup is wound with significantly weaker than the neck. This unusual configuration reflects my conviction that a weaker middle pickup makes for better quack and cluck in the #2 and #4 positions for us Notch-Only players (those who rarely if ever use the middle by itself). But if you’re a 24/7 Middle Alone player and need it beefier for solos, the middle spec can be easily altered to your taste. It can even be tapped so you can have the best of both worlds. I typically use slightly wider than vintage rod magnets (.205” dia vs. vintage .187” to .197”) most of the time to get a bit wider tone out of the neck and bridge. It also helps a little to make up for string spacing problems on some Strats. The middle pu is typically made with vintage-diameter rods to keep it thin for maximum quack but an all-.205 set is yours for the asking. The reverse –all-vintage-diameter sets – are also available. Okay, so anybody can post a cherry-picked complimentary email or post. Soundclips would be far better and we're working on that so stay tuned. But mark my words, the clarity is just devastating. They're great clean but they are frighteningly clear under gain. This pattern works great for Strat* and Tele* pickups. Need a tighter spaced neck because the E strings are too far inside the poles? Need slightly wider bridge for the opposite reason? I can do custom spacings in 49.2mm, 50mm and 53mm. (Standard is 52mm.) It’s a little pricey because custom spaced covers have to be made too. RWRP Middle Pickup................. NO CHARGE. Flatpole, softer vintage stagger, or a custom stagger of some sort? No problem -- if it makes sense. I used to advertise radius here but after making a few, it just doesn't work like all of us thought it would. The D and G dominate, the B and A are weak, the E's disappear. If having the vintage look isn't a major issue, I recommend flatpole for the very best string-to-string balance, and I don't care WHAT your neck radius is, unless it's shaped like a hair pin. I know it's counterintuitive but it's true. No-Flange Bobbin......................... $10 per pickup. This is for guitars where the pickups are mounted to the body and the cavities are routed like a lipstick tube, ie: without the triangular space facing the bridge for the side-flange where the leads are installed. The flange is cut off and the leads are instead installed at each end of the bobbin. What is “Strelecaster Styling”? 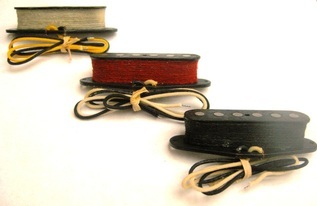 It is wrapping a coverless Strat pickup twine like a Tele bridge pickup (SEE PHOTO BELOW). Can be made with just about any color twine. Samples in the pictures below: red/white/black left, yellow-gold right. This is not JUST an aesthetic option: Flatpole with no cover means the coil itself is much closer to the strings compared to a standard Strat* design pickup with Alnico rods that protrude several millimeters above the surface of the flatwork. The result is livelier pickups with more sustain without losing the vintage tone and clarity. This means you can also set them lower to avoid the dread "Stratitis" and still get a strong signal. On the other hand, if you want to have the Strele look while keeping the traditional airy tone, they can be made with the rods raised above the flatwork with whatever stagger you prefer.